Jeep has confirmed plans to reveal its hotly-anticipated Scrambler pickup later this month. The 2020 Jeep Scrambler is the off-road brand’s first pickup truck in nearly 30 years and based on the all-new JL Wrangler. The confirmation came by way of Jeep Scrambler Forum, where the above image was posted. 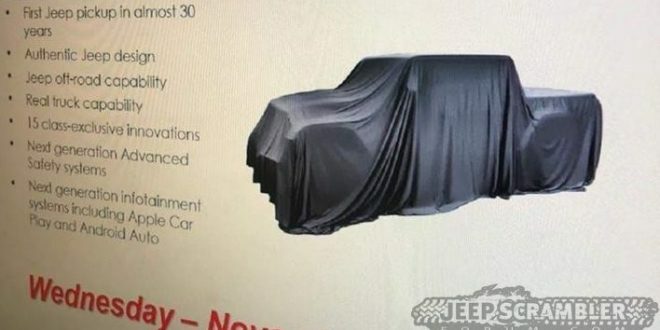 The screen-grab is allegedly from an internal dealership memo announcing the planned reveal for November 28th. Obviously the image confirms what we all already know: the Scrambler is effectively a pickup version of the JL Wrangler. Perhaps the most interesting piece of information in the teaser is the line that says “15 class-exclusive innovations.” Assumably, the means many of the features found on the JL Wrangler will come over to the Scrambler, such as removable doors. Late last years rumors surfaced suggesting the Scrambler will also offer a cloth-top variant, just like the Wrangler. Expect to learn all of the details on the 15 exclusive features and much more on the 2020 Scrambler on November 28th, when it will formally bow at the Los Angeles Auto Show. It’s expected to arrive to market sometime in mid-2019.